More Slow-But-Steady News: Fewer Jobless Claims Filed : The Two-Way It's the last bit of employment news before Friday's report about job growth and the jobless rate in December. Economists expect to hear that the unemployment rate stayed at 7 percent and that 195,000 jobs were added to payrolls. Looking for work in Florida. At a November career fair in West Palm Beach, this man had a job application in hand. 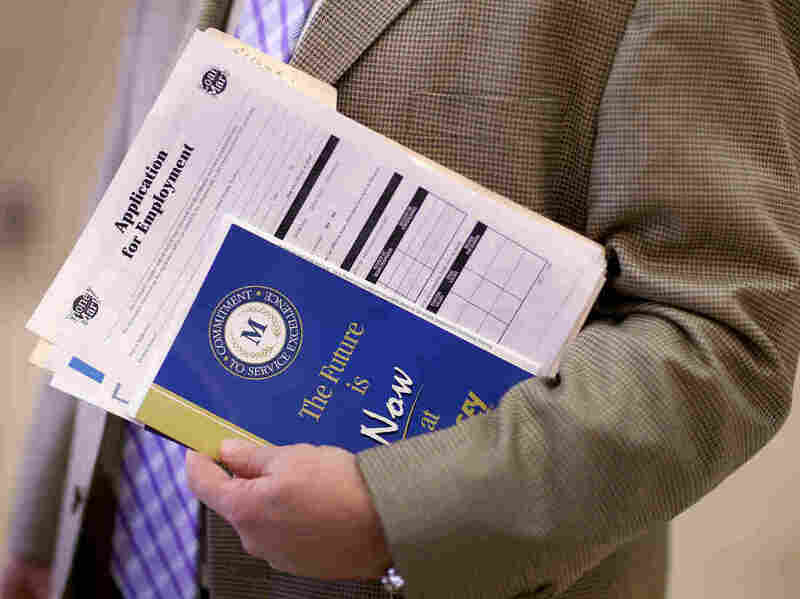 There were 330,000 first-time claims filed for unemployment insurance last week, down 15,000 from the week before, the Employment and Training Administration says. The claims data are the last bits of evidence about how the labor market is doing before Friday's scheduled release of figures on the December unemployment rate and payroll growth. Both Reuters and Bloomberg News say that economists expect to hear Friday from the Bureau of Labor Statistics that the unemployment rate held steady at 7 percent last month, and that 195,000 jobs were added to public and private payrolls. On Thursday, as it released figures on the number of claims for unemployment insurance filed last week, the ETA also revised up — to 345,000 from 339,000 — its estimate of how many applications had been submitted the week before (ending Dec. 28). Taken together, the claims report and Wednesday's news that another survey about job growth indicates there were 238,000 jobs added to private payrolls last month signal that the labor market's slow but steady improvement continues. If the jobless rate remained at 7 percent in December, that would be its lowest year-end point since December 2007 — when the unemployment rate was 5 percent. That's also the month the economy slipped into its latest recession. That downturn officially ended in June 2009. The jobless rate, as often happens, kept rising afterward — to a recent peak of 10 percent in October 2009.